The referenda in the November elections made one thing painfully clear: most Californians still believe that we can have public services without paying for them. What is quite extraordinary is not that people don’t want to pay taxes. These are hard times and many people are either in financial trouble or have well founded fears of being there soon. What is remarkable is that a large portion of the electorate doesn’t seem to want anyone else to pay taxes either. This deep ideological commitment to lower taxes, shared by Republican and Democratic voters, a norm that took three decades to permeate our entire culture, will not dissipate anytime soon. It is, therefore, unrealistic to think that this “something-for-nothing” delusion, ironically fostered by the “no-free-lunch” ideology of market fundamentalism, will go away in time for UC to just muddle through in the next few years. Our challenge is this: we have to find ways of saving public education without the public paying its share. UCOP and the Regents reached this conclusion some time ago, yet there is not much in the Gould Commission’s final report that would match the challenge of this quandary. Many of the incremental changes proposed are reasonable and will be helpful if implemented but, in the end, they will not be able to fill the hole in UC’s budget. The weakness of the report is rooted in two mistaken assumptions. The first that seemingly follows from the realization that we cannot count on the state anymore, is that UC must think about its future in one piece; the rules we put down now must guide the university throughout the 21st century. There is no medium term crisis plan for the next 4 to 7 years and another long range blue print beyond that. We are planning for a 21st century as if the worst economic crisis in the history of modern capitalism since the Great Depression would last for the rest of our lifetime and beyond. Each campus, of course, has its short term plan of survival but that is limited to modest cuts and creative accounting. The importance of chopping up the future into short, medium and long term is that what we need to do now to avoid the worst of this crisis may not be what we want our university to do once the crisis is over. The trick then is to insure that the short and medium term solutions do not impose themselves on our long term objectives. I stopped by to see you today and to offer a talk; I was looking forward to participating in the planned round table discussions as well. I hope they went forward. Unfortunately, as I understand like many others, I was barred from entry – even from speaking to any one of you in person. I was told that I had ‘no right’ to be on the university campus, ‘no business’ being there, because I was not an employee of the university. This implies that others including prospective students, parents, members of the community, researchers, even tourists have no right to inhabit the campus spaces either. No difference that I was invited by Birmingham students; your invitation carries no weight as you are ‘in dispute with the university’. The budget presentation to the Regents today: did the Regents hear from UCOP that the Brown cut of 20% of state general funds is a disaster for the educational core that needs to be blocked, and that concessions on budgetary transparency and rationality, and reductions in administrative overhead need to be made? I criticize Bob Samuels' proposal in a comment on his recent post. Much more needs to be said on various sides. . The Regents by now should have passed the Educational Policy committeee measure on "individualized review" of every application. It requires the "human read of every application that provides background on the available opportunities and challenges faced by the applicant within his or her school and community," among other things. This was required by the famous Powell Supreme Court decision in Regents of the University of California v. Bakke (1978), and reaffirmed by Justice O'Connor in the Bollinger decisions in 2003 (v.. Grutter and v. Gratz. Non-compliance (arithmetic admissions formulae that assigned points for race and other factors) were the rationale behind the anti-affirmative action upheavals in 1994-95 that led to the suspension of UC affirmative action and a decline in the representativeness of the UC student body from which the university still hasn't recovered (though the ban was rescinded in 2001). So it's not too soon to be holistic, and welcome. Up at 1 pm today is faculty and staff "competitiveness" - various compensation issues. Up at 8:50 am tomorrow is the open session on Compensation that will announce closed-session decisions about executive comp among other things - and it's right after Public Comment. This was one of the worst weeks in recent UC,CSU, and CCC history, as the new Democratic governor dished out triple $500 million cuts to all the segments ($400 m to the community colleges), thus matching the cutting record of his Republican predecessor. Comments on this blog and elsewhere suggest that some people think this is a clever political ploy, but many people are on the verge of giving up on the idea that California higher ed will ever recover under our political system. In the midst of this, there was something oddly cheerful about UC President Mark Yudof's conversation with Patt Morrison in the Los Angeles Times. He may have felt obligated to exude a leader-like calm. Under the circumstances, it would be better to exude a leader-like determination to go full tilt at the emergency. In content it was one of Yudof's best press outlings since he arrived at UC. Full cost accounting for Brown's proposed state cuts: "Remember, it's not $500 million, it's really closer to a billion, because unlike community colleges and state colleges, the state doesn't give us money for employer contributions to the pension plan, so that raises the real cost [of the cuts] to $700 million; then you have union contracts, energy contracts, inflationary increases -- we really have a billion-dollar problem." The racial dimension of underfunding. This issue rarely gets broached in print, but it has to be. Here, Yudof says,"The truth is, the deterioration of [education] funding predates this horrendous Great Recession. It's not like things went really great between 1990 and 2007, and then all of a sudden we had this problem. Some of it's driven by demographics -- an aging population of voters [worried about] Social Security and police protection. We have a huge demographic of Hispanic youngsters. It's no time to trim back and say, well, they're not our children; well, they are our children, maybe not biologically, but they're our children." Scratch the biological othering and you have an important statement of a major origin of our self-dissolution. 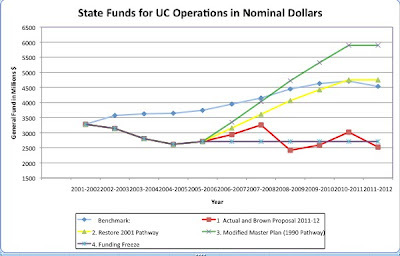 I have updated the chart of the University of California's funding pathways to reflect the budget proposed by Governor Brown this week, as a companion to Michael's policy analyses (1 & 2). The first version appeared in the Futures Report, was updated for the Cuts Report, and was updated most recently to reflect Arnold Schwarzenegger's May Revision last year. The Benchmark (blue diamonds) reflects a universe in which the state's research university finds its revenue going up and down in an exact reflection of per capita personal income. The latter measures a population's ability to pay. Since California per capita income declined 3.4% in 2009 (for the first time in all recent recessions), the benchmark dips to reflect the previous year's conditions. In some socially rational universe, this condition would reflect a normal but not exceptional commitment to maintaining the society's steady and even improving educational levels. The 1990 Pathway (green line) reflects a hypothetical commitment the state's leaders might have made in 2005, when they formed the Compact for Higher Education instead, to restore "Master Plan" levels of funding. Yellow is a more modest recovery of the 2001 Pathway after the cuts of the decade's first recession. The Funding Freeze reflects a scenario in which the state consciously decides to cap its commitment of general funds and "privatize" systematically. Finally, the red line is where we have actually been. Jerry Brown's proposed cut to UC (and to CSU) of $500 million is a 20% one-year cut in the current general fund revenue. This is similar in scale to Arnold Schwarzenegger's drastic 2008-09 cut. He is proposing a repeat of Schwarzenegger's disastrous cuts. Perhaps the best thing to be said about Jerry Brown's proposed budget is that it could have been worse. Unfortunately, it may still be. The proposals that Brown has put forth--with their severe cuts to higher education, childcare, in-home services for the elderly and disabled, cal-works, and other social services--depend on the Governor getting a series of tax extensions on the ballot and on the people of California approving them once they are on the ballot. There is no certainty that these things will happen. Instead, come June we may be facing an even more brutal budget proposal--with even deeper cuts and a continuation of California's now conventional budget difficulties. 3) In his accounting Brown is making a strong and significant division between General Fund and Total Funds as regards higher education. This distinction is quite normal but in this instance the budget summary draws a great deal of attention to the fact that the budgeting (and the cuts in General Funds) is predicated on the recent Tuition and Fee increases at UC and CSU as well as a proposed fee increase at the Community College level. 4) The Budget also insists that how the approximately 500M in cuts to UC and CSU each will be made will be done in conjunction with stakeholders in each system. (150, 151) (I am assuming although I may be wrong that the 500M number is primarily the cut in General Fund and the loss of ARRA or equivalent funding). 5) What strikes me as of interest in the way that that discussion is set up is that Brown insists that the cuts must be targeted in ways that do not lead to more tuition increases or enrollment cuts. This position is in sharp contrast to the comments on a proposed fee increase for the Community College System where the budget defends the relative lack of expense of the system even with increased fees. 6) Put another way, the Budget suggests to the Regents and to the CSU Board that tuition increases will be counted against general fund support--not as something that can be added onto it. The systems will now be losing funding relative to the amount they shift onto students. 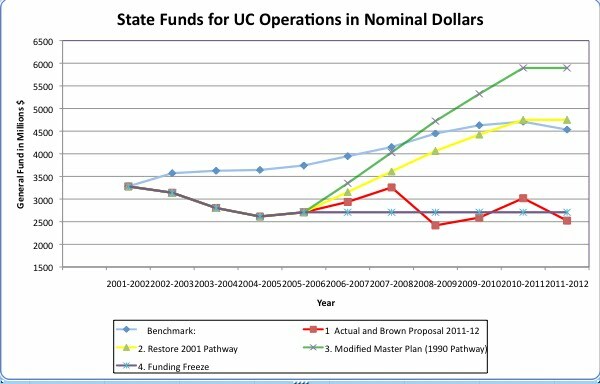 It suggests that Brown is no longer willing to have tuition go up inexorably unless UC and CSU are prepared to lose out on all General Fund support. The country has so many problems that need solving and yet many of us are having to spend all our time fighting for a decent wage and benefits. We have to do it, we have to make sure they respect our profession. But with everything else that needs doing in the country this is such a waste! (Maria Maisto). The public money for higher education isn't coming back, no matter how much we protest (AAUP president Cary Nelson). I pressed him on this, given the fact that the student fee-hike protests of November 2009 are probably what kept Arnold Schwarzenegger from continuing cuts in the following year. Cary said yes but it's not springing new money, and won't. It's a waste of time to go to the statehouse. Federalize public higher education. Cary said this would cost $60 billion, a drop in the defense bucket. Argue it on fundamental principles: higher education is a fundamental right, it should be free, it should create no debt. . . The new dominant faculty feeling is Fear. "Fear now dominates the academic world. Amazingly it has conquered arrogance as the main faculty emotion." Faculty have become dormant and passive again. They are forfeiting the chance to make alliances with staff and students, and the window is in danger of closing (Joshua Clover). New Faculty Majority. Fear is there, but can and is often overcome. We need to educate the public on the reality of contingent labor, and have been doing this (Maria Maisto). On unemployment in Ohio one can make more money than teaching 3 courses as contingent faculty. Yesterday, I spoke on two of the panels for the Modern Language Association Convention's series, "The Academy in Hard Times." The first was Marilee Lindemann's panel, "New Tools, Hard Times: Social Networking and the Academic Crisis." Lindemann types for the excellent Roxie's World blog on academic crises and on culture, and spoke about the use of animation tools and of comedy in getting the word out . Rosemary Feal also spoke. The executive director of the MLA and who, among many other achievements, has brought Twitter to the MLA and tweets as MLAConvention. Marc Bousquet was there, author of How the University Works and a consistently important voice on the economic and labor politics of the profession. He also spoke about new tools for teaching and communicating to the wider world like Xtrannormal, reminding us that So You Want to Get a PhD in the Humanities? has been watched a million times, or 10 times the number of faculty and graduate students teaching in the US, UK, and Canada combined. Also speaking was Brian Croxall, prominent tweeter and blogger at ProfHacker and on his own page. Having become nationally known more or less overnight for his explanation -- Absent Presence --of why he couldn't afford to go the MLA convention in 2009 to deliver his paper. Read the post for an excellent overview of the financial plight of a large percentage of jobmarket candidates. , Brian described the features of social networking that make it valuable, and at one point remarked that "Twitter was the best thing that ever happened to my career." "Hard times" in the title means among other things the ongoingly terrible job market in English and foreign languages not to mention History, and the job market continues of course to have a monopoly on access to professional employment. But Brian's comment recalls that online publishing, blogging, and tweeting have destroyed the profession's monopoly over professional visibility. On December 29, 2010 the San Francisco Chronicle reported that, "Three dozen of the University of California's highest paid executives are threatening to sue unless UC agrees to spend tens of millions of dollars to dramatically increase retirement benefits for employees earning more than $245,000." Some of these "Gilded 36" receive salaries in excess of $500,000. All will receive sizable pensions, even without this increase, while their salaries, bonuses, and perks allow opportunities for additional retirement saving and investment. These are opportunities the majority of UC employees and Californians can only dream of. In their letter to UC President Mark Yudof, these executives and deans stated that failure to increase their pension benefits would be "demoralizing" to them. We- faculty who teach and guide students towards careers and contributions to society- point to other, far more demoralizing trends on UC campuses: Tuition increases that force students to borrow more, take on second jobs, and withdraw before finishing their degrees; budget cuts that vaporize classes in key subjects, wipe out hours of library access, and leave unfixed broken chairs, projectors, and lavatories; layoffs of skilled staff that gut essential services; declining graduate student funding that leads the brightest applicants to choose private Universities over UC; realizing that teaching and working at UC does not mean that you can afford to send your own children to its campuses. The question to ask the Gilded 36 goes beyond contracts and lawsuits: Can their demand for tens of millions of dollars in additional pension payout be justified morally and ethically given the fiscal shortfall facing California, when budget cuts imperil the instructional and research mission of UC, and when the UC employee pension faces a $21.6 Billion unfunded obligation that threatens the futures of thousands of UC employees and their families? By making the UC pension appear to be an excessive giveaway, the Gilded 36's demand obscures the real function of the pension as deferred payment for the hard work that UC employees do now to ensure that the University remains an engine of education, innovation, and shared benefit for California.